The Kingdom of Vikesland does not Tax its citizens so therefore looks to alternative methods of income to support Government workings. Currently Money is being generated via on-line sales, film, music and other artworks. Vikesland also has adopted a barter system where artworks of all kinds can be bartered for services or goods. 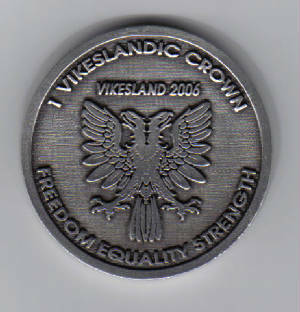 Our monetary currency is the Vikeslandic Crown. 1 crown is equal to 1 U.S. dollar. Alternatively we use an artistic barter system, trading original artistic works of all kinds for other goods and services. Value of these works is determined by the citizens involved. The first coin minted is 1 1/4 inch fine pewter coin in a $1 V.C. denomination. Due to it's popularity the 1 V.C. coin has sold out. Sorry for any inconvenience. By permission of HRM King Christopher I.